A medium to large Tyrannosaur, or a gang if you feel sadistic. Oldie but goodie, but if anything, I think people actually understate how dangerous and frightening these creatures were. Tyrannosaurs were usurpers in the grand game of evolution: they started as small, raptor-sized beasts, many times smaller than contemporaneous apex predators (Carnosaurs like Allosaurus, Acrocanthosaurus, etc). The Carnosaurs reigned everywhere on earth until the end of the Cretaceous, except North America and Asia, where the Tyrannosaurs completely overtook them. See, the big carnosaurs' killing style was hack and slash: they'd hack into their prey using their head like it was a gigantic axe. Small prey would be crippled, but large prey like sauropods would probably survive (for a while). As such, their teeth were like steak knives, designed to cut through flesh & sinew, maximising blood loss; their heads designed for shock absorption. 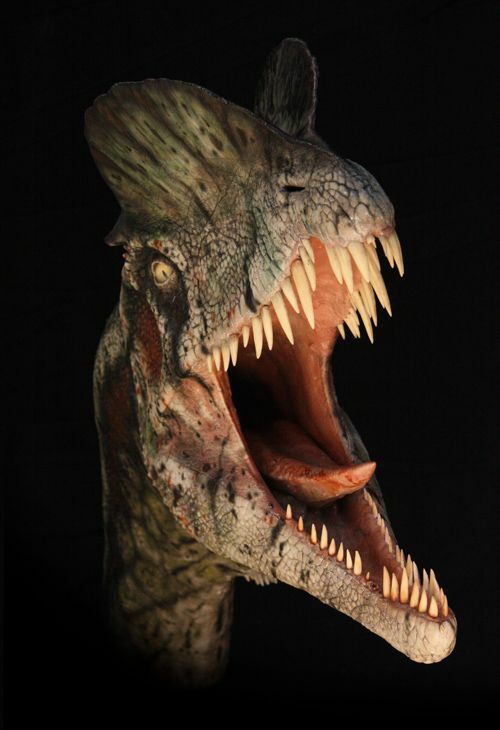 Tyrannosaurs didn't go for that: their heads were designed to absorb sustained pressure, and their teeth to puncture. A large Tyrannosaur has one of the most powerful bite forces in the prehistoric record - enough to crush bone easily. There is practically no creature on earth, past or present, which could survive a well-placed bite. One should also never forget the danger of ambush predators. People expect predators to announce their presence with a big scream, shaking the brush, thundering their footsteps, like Rexy in Jurassic Park. But consider - Rexy is not hunting in her first two appearances. Her earth-shaking is territorial, alerting other predators & demanding they stay away. 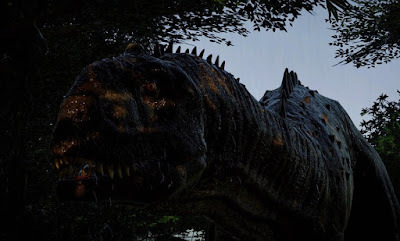 Similarly, when she comes upon the jeep searching for Grant and the children, she views it not as prey, but as a trespasser: Rexy was scaring the jeep off. When Rexy was hunting, you never saw her coming: she sneaked up on the raptors and lunged. No roar, no footsteps, because that's how she hunts. But the scariest thing about a Tyrannosaur? Its call. Look, I love Jurassic Park's Rexy, its awesome roar is iconic. But the latest reconstruction eschews a triumphant roar with a deeply unnerving infrasound rumble, like a crocodile's territorial bellow. Species: We all know and love T.rex, of course, but there are a wealth of cousins in the Tyrannosauroidea which would offer varying levels of threat to a would-be adventuring party. There's Yutyrannus, the largest feathered dinosaur known from the fossil record; Nanuqsaurus the feathered polar tyrannosaur; Qianzhousaurus, or "Pinocchio rex" for its uncannily thin snout; Albertosaurus, Gorgosaurus, or Lythronax if you want a T.rex that could squeeze through a door; Zhuchengtyrannus or Tarbosaurus if you want an alternative to T.rex that retains its impressive size. These were weird dinosaurs, about halfway between a T.rex and a raptor. There's something distinctly... wrong about them. They had practically no arms to speak of, only these weird vestigial lumps with a few claws that makes them look like mutants. They have extremely short snouts compared to most carnivores, evoking a bulldog or rotweiller. They were covered in scutes, knobs, and bones, often adorned with short horns (Carnotaurus had two above the eyes, Majungasaurus one stubby unicorn). But what's most unsettling about them is that they're one of the first dinosaurs to display endemic cannibalism. Living, as they were, on Madagascar, Majungasaurus were among the only creatures on that island, and isolation made them a bit strange. If you wanted to give your adventurers a reprieve, either two decide to fight among themselves, or a single Majunga is foiled by another, bigger beastie, which then mistakes your adventurers for rival predators, & decides to hunt them down. Species: the aforementioned Majungasaurus & Carnotaurus are quite well known thanks to their appearances in documentaries and films: creatures similar in general size include Rajasaurus, Ekrixinatosaurus, & Abelisaurus itself. For a smaller raptor-sized creature that could terrorise a group in larger numbers, then a beast like Skorpiovenator, Rugops, or Kryptops (which was likened to a Cretaceous Hyena) fits the bill nicely. 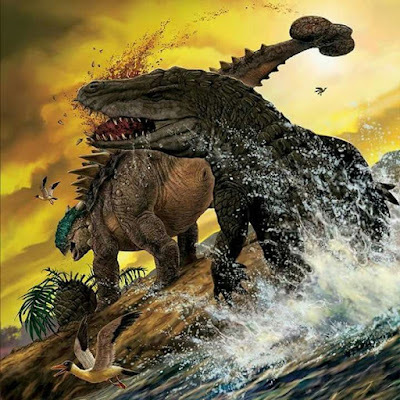 Alternatively, you could go larger with Pycnonemosaurus, the largest described Abelisaur - though there is a nameless beast in Kenya which is speculated to be even larger. It's believed that most dinosaurs could swim, but your adventurers may think they were safe in the water. They would be very, very wrong. For one thing, it was competing with another creature that would be the apex predator in nearly any other environment - Carcharodontosaurus, a Carnosaur the size of T.rex. For anything that size to occupy the same environment, it had to be a dangerous creature itself. What made it particularly dangerous was not only its crocodilian jaws, but its huge claws: a good swipe would crack open a human's head like a peanut. For another, we know from remains that it preyed on sharks. Not just sharks - sharks with frikkin' chainswords attached to their noses. The thing ate sharks and lived alongside T.rex-sized monsters with knives lining their mouths. The sail might be a bit of a maker for it, if you want to do a "jaws" thing - but the similarly-sized and definitely bipedal Suchomimus lacks it, so it could menace our heroes on land and water. Species: Spinosaurus is naturally the best-known, but you could be a giant palaeontology nerd & use the similarly sized Oxalaia or Sigilmassasaurus. If you want something a bit smaller and without the ostentatious sails, then Suchomimus, Baryonyx, & Siamosaurus would still present terrible threats. If you want creatures to pursue you through a tangled swamp thicket or ancient sewers, then Ichthyovenator, Irritator, or Ostafrikasaurus would give most adventurers a run for their money. So far the nightmare fuel is similar to that of dragons - big huge toothy clawy monsters that can and will end you if you let them get at you. But what about something smaller in scale, where the fear is subtler & more insidious? Yes, a raptor, because they're scary. But pop cultural osmosis means that we know raptors too well: we know they're smart pack-hunters with sickle-claws. How do we make them scary in a new way? Why would giving them feathers make them scarier? Well, one theory regarding raptor hunting techniques is that the wing feathers were used as stabilisers as they struggled with prey. Rather than disembowel their prey with their sickle-claws a la Jurassic Park, it's believed those claws were used as grappling hooks to latch on to prey, freeing the head to do the deadly work, with the wings acting to balance. They were, according to Jaime A. Headden, "terrestrial hawks," which is rather appropriate for dinosaurs commonly referred to as raptors. Imagine being attacked by a goose or a swan. Except this goose has hooked itself onto your flesh Texas Chainsaw Massacre style, is beating you black and blue with its claw-tipped wings, and is tearing at your face & neck with razor-sharp teeth. 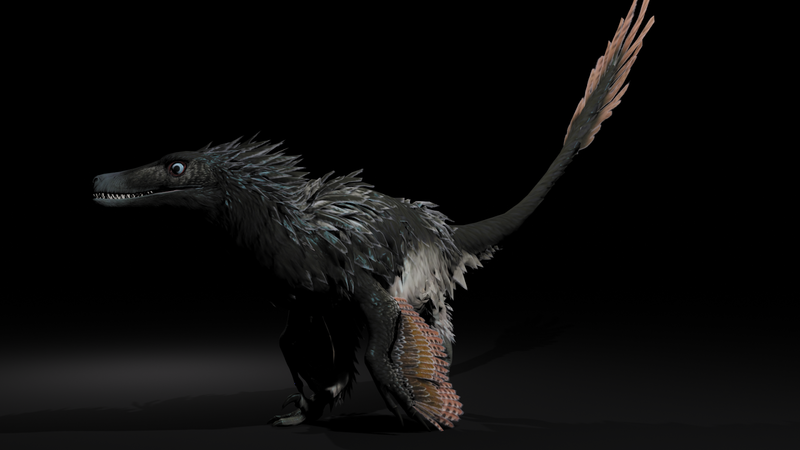 Species: If you want the Jurassic Park raptor with feathers, then Dakotaraptor or Achillobator are good choices; Utahraptor is the largest dromaeosaur yet known, and could prove a dangerous foe to even a group of humans; Austroraptor has an unsettlingly thin, needling snout like some nightmarish Jim Henson creation; and even with their smaller size, a large pack of Deinonychus, Velociraptor, or Dromaeosaurus could really challenge an unprepared party. The easy (lazy) thing I could recommend is look up Jurassic Park: The Game, who made one of the most nightmarish dinosaurs in any medium. But a lot of the elements that made Troodon scary in that game are inventions, like Dilophosaurus' venom, and on a purely combat basis, Troodons wouldn't be that much of a threat to adventurers compared to some other dinosaurs. 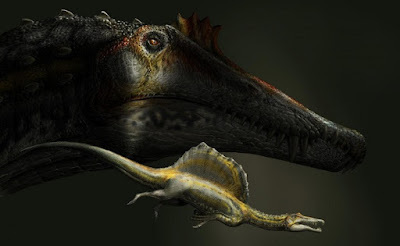 So let's look at the real Troodon, and what we know. First, it had huge eyes for a dinosaur, and combined with its boreal position (one large species was found in Alaska), we can reasonable assume it had very good night vision. 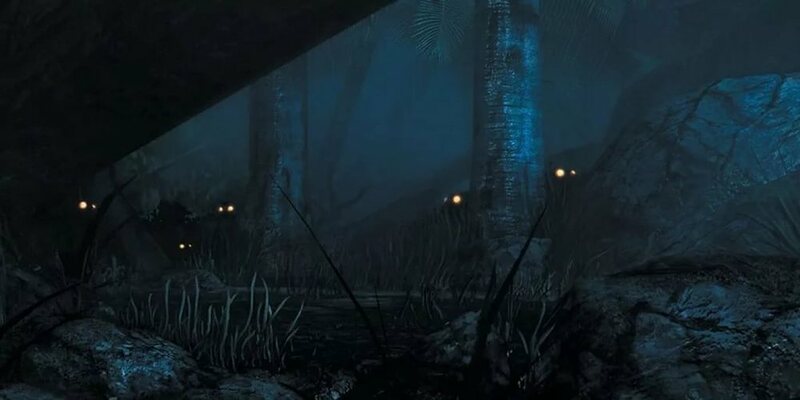 A creature that can see you in near pitch-blackness is, naturally, going to be very scary for our adventurers - not to mention freaky, seeing enormous gimlet eyes glinting in the dark. As for weaponry, Troodon isn't dissimilar to its Dromaeosaur cousins: a sickle claw on its foot and feathers suggest it might hunt similarly. Its name, "wounding tooth," is a reference to its serrated teeth - evidently it preferred shredding flesh to crushing bone, which means heavy exsanguination. If you wanted to borrow from JPTG, giving it a venomous bite could add some body horror - fever, hallucinations, whatever you like. But its greatest, and potentially deadliest, weapon is its brain. Troodon's intelligence, like that of all dinosaurs, is hotly debated, but in strictly brain-to-body ratio, Troodon has one of the largest brains of any dinosaur, estimates ranging from ostrich (dumb as a box of rocks) to opossums (surprisingly intelligent). But, again, encephalisation quotient is not definitive, so Troodon's true intelligence is unknown. But let's say, for the sake of nightmare fuel, that they are as smart as the smartest birds today - corvids & parrots. Corvids can recognise, and remember, faces - especially the faces of those who wronged them. They investigate the deaths of their comrades. They've figured out traffic lights. Some of them can craft tools. They understand cause and effect, and utilise that understanding to solve puzzles. Different communities have different dialects. They deter predators through weight of numbers. They even engaged in asymmetric warfare against Japan. Imagine a crow the size of a greyhound. Imagine it could use sticks, rocks, manipulate them with their teeth into simple tools. Imagine it could set traps - corralling its prey into a corner with subtle signals and ploys. Imagine it could co-ordinate, strategise, plan: sneaking into a camp at night to steal supplies, destroy vital equipment, cause all sorts of chaos. Imagine it knew exactly how to find out your vulnerabilities and exploit them. All in pitch blackness, from the trees, as stumbling adventurers panic. People expect humanoids to set traps and use tactics. They don't expect mere animals. "What do you mean they cut the power, they're animals man!" They don't expect animals to trick them into falling down a ravine, cause a rockslide, slip into a crevasse. They don't expect animals to outsmart them. Species: Troodon is really the best bet you have, though the comparatively huge Latenivenatrix could offer a larger threat; there are also close relatives Saurornithoides, Albertavenator, or Stenonychosaurus. The Unenlagiinae family of Dromaeosaurs are more lightly-built than their robust fellows, so a creature like Unenlagia or Unquillosaurus could offer a mixture of both groups. Yes, yes, we all loved the delightful Triceratops in Jurassic Park, and adored little Cera in The Land Before Time. But Ceratopsians have a dark side: we know from remains that they engaged in conflict with one another, many suffering nasty wounds and fractures that lasted their whole lives. They definitely weren't peaceful plant-eaters all the time. One should also consider that it's thought Ceratopsian herds were similar to that of elephants, led by matriarchs, with most males being juveniles. So where were the males? Out in the wilderness, alone, fighting the world. A group of adventurers coming across a lone bull Triceratops, or even a smaller species like Styracosaurus, would find themselves in deep trouble if they're not careful, especially if they're undergoing something similar to an elephant's musth. 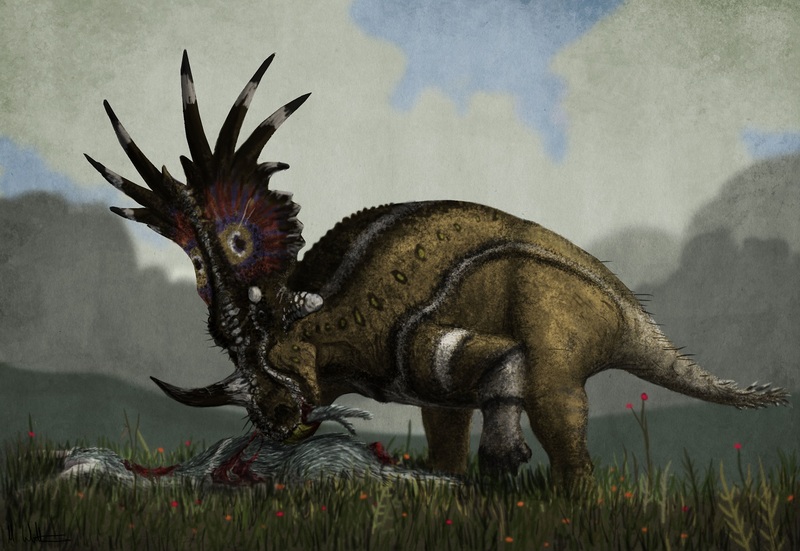 Another nasty theory came to my attention recently: the sharp beaks, strong jaws, and scissor-like teeth of Ceratopsians are uncannily well-suited to slicing flesh. This led to the hypothesis that they might top up their proteins and minerals by eating the occasional cadaver, as turtles and other usually-herbivores do today. A wild bull in a bad mood is dangerous enough. A bull the size of an elephant, with skin as thick as a crocodile's, a shield and swords on its head, and a beak ten times the size and power of an eagles, which might be in a mood for some red meat? Better just run! Species: the jury's out on whether Triceratops was a herding creature given most remains have been solitary individuals, with the first bonebed only being described in 2009 - which is just as well, as one Trike is more than enough for even the most battle-hardened adventurers. 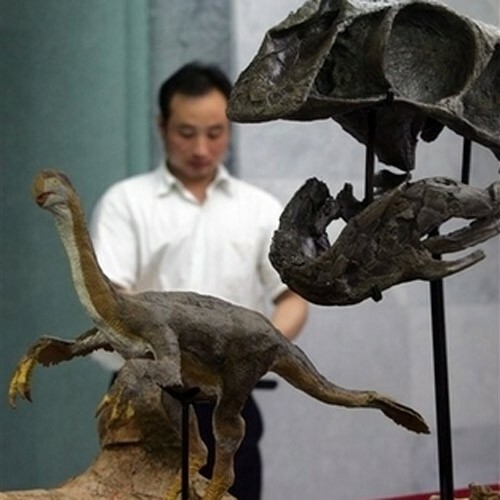 However, there are several species which have been discovered in mass graves of hundreds or even thousands of individuals, ranging from the little Zuniceratops, to medium-sized Centrosaurus, Styracosaurus, and Agujaceratops, to the massive Anchiceratops, Pachyrhinosaurus, & Torosaurus. Ah, but ceratopsians are cuddly and cute - more importantly, they're familiar. 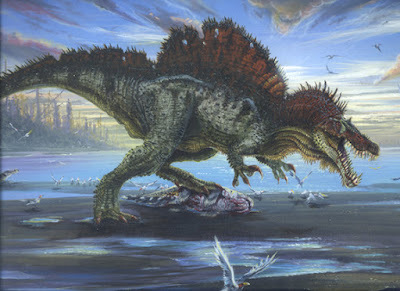 Well, what about one of the weirdest, most bizarre, & potentially terrifying, dinosaurs of them all? Picture a head poking out of the bushes. It's a bit like a bird's, roughly the size of a horse's head. Now imagine it starts to emerge: a long, snake-like neck follows. Eventually it rises up to maybe 15 feet above the ground. A massive body, covered in feathers, emerges: its wings tucked underneath like a gigantic chicken. A massive potbelly rumbles with each footstep. Finally, a long tail swishes the branches. You think, what a weird thing. I wonder what it tastes like? So you and your adventurers start brandishing your weapons, trying to figure the best way to kill it. You try menacing it, chasing it into some corner of the forest. But this creature is not afraid. It seems to barely even notice your presence. Frustrated, one of your fellows jabs it in the leg, hoping to startle it. A hideous scream like a monstrous bird pierces your ears: a blur and a terrific wind knocks your man to the ground. You all turn to help your man. One grasps an arm, the other his shoulder. Both come clean off his body. Your companion has been sliced into pieces. Stunned, you robotically turn to face your erstwhile prey. It has crouched slightly, its wings spread wide. But it is not feathers on the end of its wings: three long fingers spread out. Each finger is tipped with a terrible claw, easily the length of a scimitar - the claws of one hand dripping with gore. Species: Therizinosaurus is obviously the largest & most bizarrely terrifying, but there are a goodly number of Danger Floofs to choose from: Nanshiungosaurus, Alxasaurus, and Nothronychus aren't much smaller than their Mongolian cousin; the bear-sized Erlikosaurus, Erlianosaurus, & Segnosaurus could still easily disembowel a human; even a smaller creature like Falcarius would pose a challenge. In the vein of "what the HELL is that" order of Dinosauria, how about a distant relative of both Therizinosaurus and the raptors? From a distance, it just looks like a slightly balding bird: parrot-like head, ostrich-like body. Then you realise it isn't small - you're far away. Gigantoraptor is the size of T.rex: its beak could bite into a great helm like it was nothing, if it didn't just blow you away with a beat of its huge wings. But what would move a Gigantoraptor to be so dangerous? Simple: when its eggs are in danger, it will die to protect them. Oviraptorids originally got a bad name, as their remains were found on top of clutches of eggs - no doubt they meant to steal the eggs, early palaeontologists thought. But when some bright spark decided to study the eggs, they found that they were not those of herbivores - they were overaptorid eggs. They died defending the eggs, not preying on them. A creature willing to die to protect its nest is certainly willing to kill to protect it. 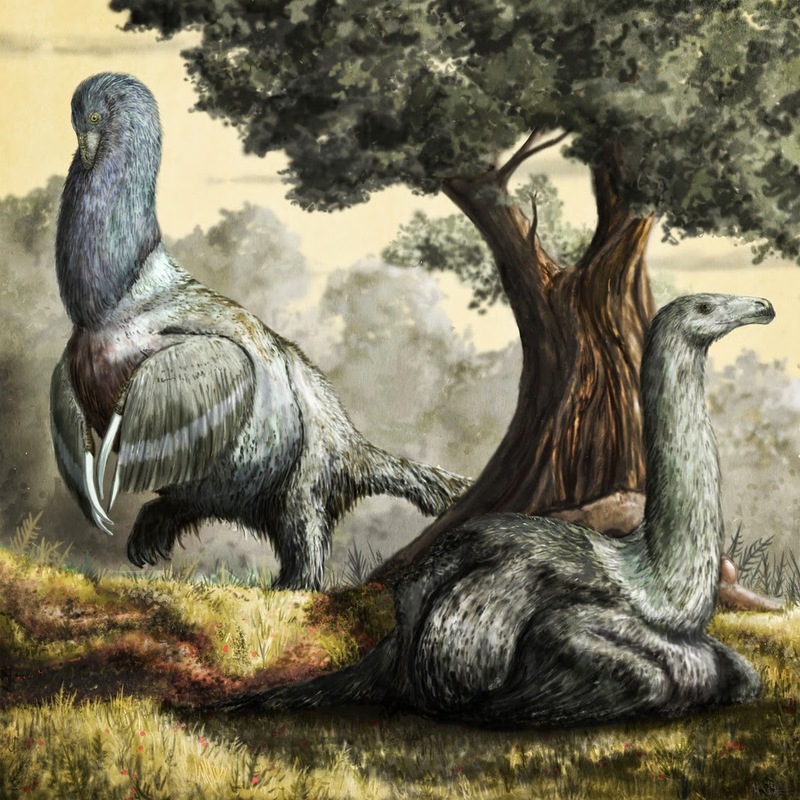 Species: Gigantoraptor, obviously, but there are a few other sizeable genera in the much-maligned Oviraptora: the North American Anzu and Citipati were bigger than a man. Alternatively, one could go for another weird giant feathered beastie in Deinocheirus, the Duck-Headed Sloth-Clawed Bear-Lizard-Bird. Of course, adventurers can be cocky. Given enough preparation, they can kill anything, right? "There's nothing in the universe cold steel won't cut," after all. But what if there is something that you probably couldn't pierce with an axe or a hammer? It's a tank, plain and simple - even the things' EYELIDS were armoured. It's the closest thing we've gotten to a rock golem in the natural world. Its club tail - a fused bone the size of a human torso - is one of the few things that could give the mighty T.rex pause. If you get hit with it, you will die. Unlike Ceratopsians, Ankylosaurs are currently thought to be solitary creatures, or at least only live in smaller family groups. It probably wasn't the most gregarious of creatures: if you got too close to it, it wouldn't think anything of swiping you into a bloody ruin with its tail, or even just shoving into you with its shoulder. Imagine going up against something against which your sword will be utterly useless; your shield pointless; your armour worthless. And imagine you made it angry - what could possibly stand in its way? Species: Ankylosaurus, naturally, with Euplocephalus, Dyoplosaurus, and Tarchia being good alternatives. Most Ankylosaurs are basically the same basic shape, but their relatives the Nodosaurs have a bit more variety, from the spiky Sauropelta to nobbly Nodosaurus. The wee guy from Jurassic Park with the frill and the spit? Aye, the very same. But why, Al? Why is this one scary? It's hard to say. It could be because the scene in the book was far, FAR scarier: none of the tension-breaking humour, none of the "cuteness" of the smaller Dilo. Just sheer dread and horror. Nonetheless, there are other elements to Dilophosaurus which make it distinctive from other carnivorous dinosaurs. For one, its jaw was weak and brittle. How could a creature, the largest carnivore of its time, actually hunt when its had such meagre weapons? Theories abound - it was a piscivore, it was a scavenger, etc - but what's unsettling is that you don't get a quick death with an inefficient killer. Most carnivores have vested interest in killing their prey as quickly as possible. You could be inventive. Jurassic Park obviously introduced the venom, but perhaps it was a "flesh-grazer" like later Carcharodontosaurs - running to its prey, ripping a piece off, and darting back, leaving its prey to slowly bleed to death. Alternatively, perhaps there's some unknown function for the crests which has eluded modern science. Who knows. All I know is the thing looks *wrong* - the notch in the snout, the dual crests, the long snakelike body, all while being large enough to view humans as prey. It just gives me the heebie-jeebies.